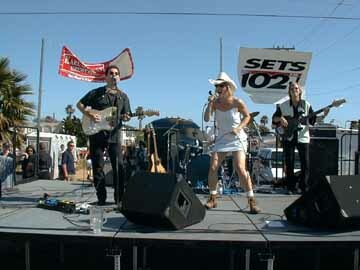 Eve Selis is one of the two surprises I discovered at the Pacific Beach Street Fair for 2000. Eve really has put together a great band. This group is a must see! 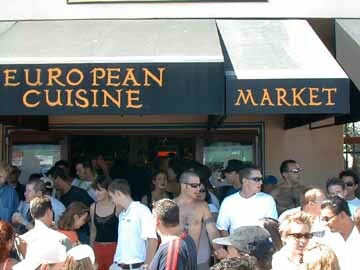 Keep in mind, if you don't catch her live here in San Diego soon, you'll end up having to pay big bucks and wait for the once a year or so that she will be back home. 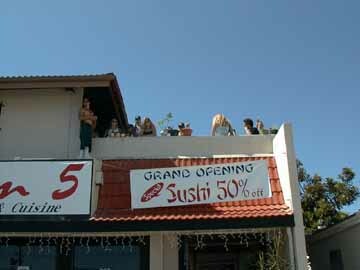 San Diego Beachlife Magazine expects Eve Selis and band to go Big-Time real soon. Move over Dixie Chicks and Shania Twane - Eve's on the way. Eve shows me her photo on the cover of "SLAMM" Magazine! in the red shorts tried to impress them with his "Six-Pack"
on Garnet Ave. have a chance to show off to thousands of patrons. 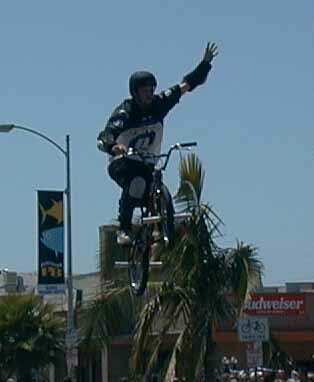 Above, Tony Skojec floats high above Garnet Ave. on his Bike. 4812 -1/2 Santa Monica Ave.
it was but I was so taken by her beauty that I didn't get beyond taking her photo. 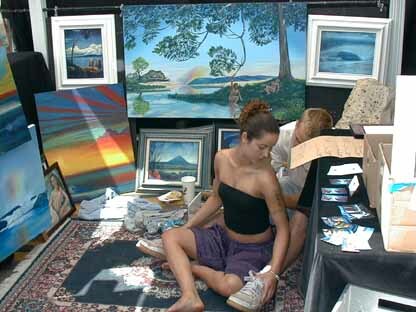 Many companies were introducing new products to the public with free samples. This product representative was introducing fair goers to "Ice Breakers" mints. 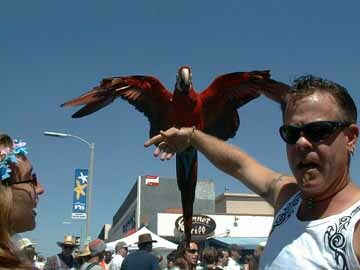 This bird had some guy to carry him around and show him off to people. This group of people saw my camera and wanted their picture taken. Ok, the two girls were "super way cute" so here's the photo. Bridget Joyce and Band played at Moose McGillicuddy's (took me by surprise, I missed this always great show by looking in the wrong place, my loss) and will be releasing a new (my second big surprise of the day) CD "Orange" early this summer. 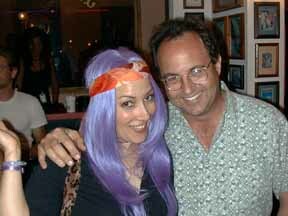 Bridget's new CD will undoubtedly continue the success that her first CD "Purple" still continues to enjoy. 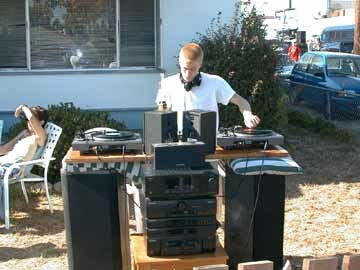 This guy was one block off the "Main Drag" in his front yard doing an "Itchy Scratchy D.J." thing. His friends enjoyed his beer and his artistry so they stuck around. While walking back to the car I saw this young lady throwing a football. Let me tell you... She has an arm on her... I'm trying to become her agent so Vogue Magazine (oh did I say she stunningly beautiful) if you're looking for your next cover girl or if the Chargers are ready for someone who can really throw the football, then give me a call.